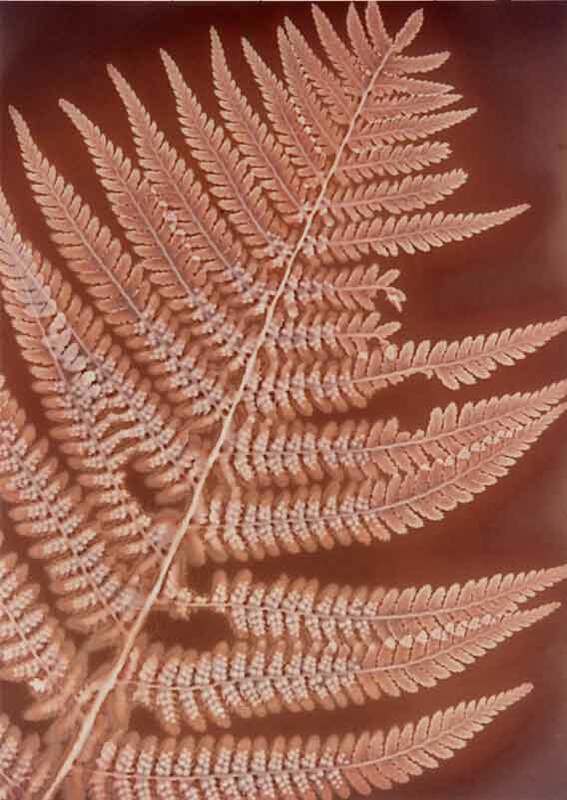 In the examples below leaves were sandwiched between a glass plate and photosensitive paper, then exposed to direct sunlight. When a satisfactory degree of darkening was apparent the paper was 'fixed', to remove any remaining light sensitive material thus rendering the image permanent. B&W photographic paper was used the colours are due to the Printing out ('developing') effect of the Sun on the emulsion. A similar technique was used to 'Print out' a positive print from the negative image produced by the camera in the early days of photography. Printing - out an image consists of placing objects ( ref Photograms ) or a negative ( ref Contact Printing ) in contact with the emulsion surface of the photographic paper and then exposing it to a bright light source such as the Sun. 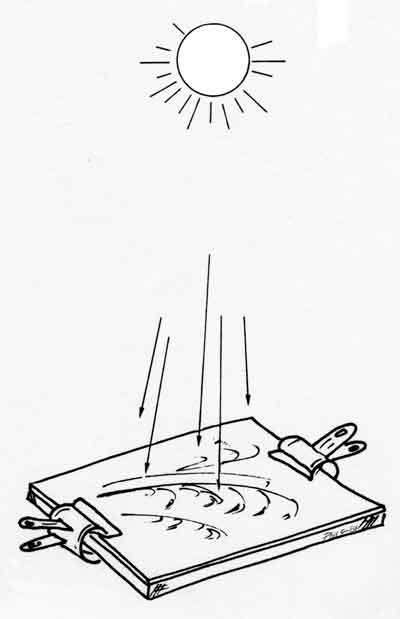 The areas exposed to the light will start to darken as metallic sliver is formed from the salts, in proportion to the transparency of the object or negative. When it has achieved the desired degree of darkness the image is made permanent by removing any remaining light sensitive material by dissolving them out - i.e. 'Fixing' the image. Unfortunately modern photographic papers are designed for 'Developing Out' based on silver bromide emulsions which have a lower silver content giving paler images than the the silver nitrate emulsions of true 'Printing out Paper" (POP). 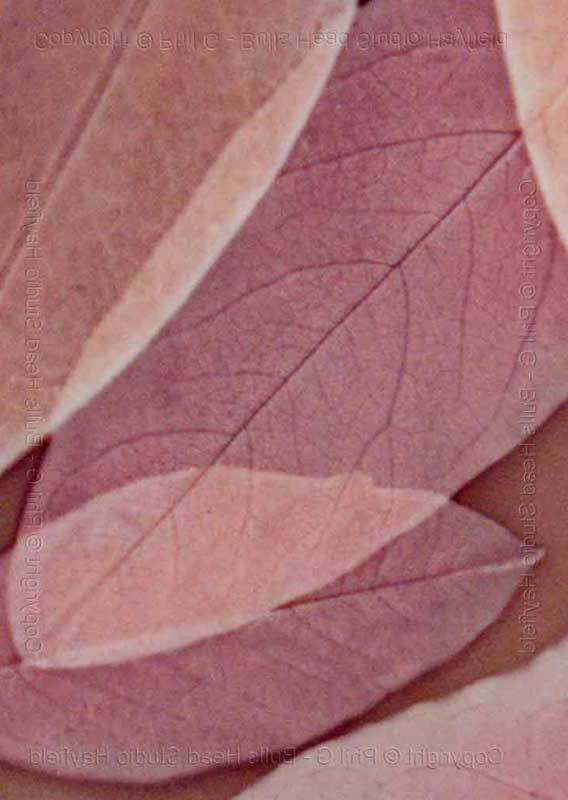 Nevertheless some quite interesting colours can be achieved ranging from pale pink to greens and browns different types of paper giving different colour tones. Exposure times can vary considerably depending on the degree of brightness from say 30 min in bright sunlight to many hours on a overcast day. These notes are a guide based on our practice you should ensure that you follow the recommended Health and Safety practice for your organisation. "Photography is not only an end in itself but also a powerful Vehicle for Learning"